"When did this become OK?" 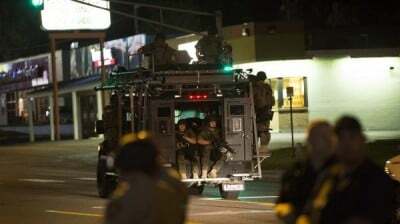 Former Marine Paul Szoldra warns that events in Ferguson, Missouri illustrate the “terrifying” result of the militarization of police, with the American people now being treated like insurgents in Afghanistan and Iraq. In an article for Business Insider, Szoldra questions why police in Ferguson are wearing combat gear such as desert camouflage which is normally reserved for troops fighting in foreign war zones. The former Marine notes how police in Ferguson are armed with military-style rifles with scopes as well as body armor. “When did “protect and serve” turn into “us versus them”? asks Szoldra, asserting that the sight of police in militarized combat gear is not helping the situation. While the initial looting in Ferguson was deplorable, it’s clear the town is now the victim of a huge militarized police state exercise. The unrest was first sparked by the shooting of 18-year-old Michael Brown on Saturday night, who was unarmed when police gunned him down. Law enforcement authorities claim Brown was involved in a physical altercation with an officer although eyewitnesses said he was shot for no reason. Peaceful demonstrations continued last night, with around 250 protesters marching down the main road into Ferguson where they were met with a heavy militarized police presence. “Officers in military-style uniforms, some carrying high-powered rifles and wearing balaclavas, formed a line at least two men deep and blocking the entire width of Florrisant Street,” reports the Guardian. One man had a red police gun laser pointed at his chest while another drove a car at high speed stopping just short of the police line. A second man in the city was shot by police last night while another woman was struck in the head with a rubber bullet as police again used tear gas to disperse a small crowd. Infowars reporters Joe Biggs and Jakari Jackson are on the ground in Ferguson, St. Louis. Last night they witnessed police pointing sniper rifles at protesters while cops also threatened to arrest demonstrators.